"You can imagine how much I hate them," he told BBC Radio 5 live. "It's only fans who do this, or they call themselves fans. "I wish they could go and be fans of something else." "It's heartbreaking in a way because you're trying to tell stories, and stories depend on surprise," said Moffat. "So to have some twit who came to a press launch, write up a story in the worst, most ham-fisted English you can imagine, and put it on the internet [is heartbreaking]. He said the majority of Doctor Who fans were "spoiler-phobes" who refused to go online for fear of finding out any information in advance. "They want to preserve the surprise," he said. "The tragedy is you have to work hard at that now." 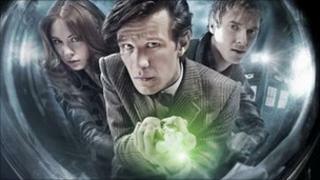 Moffat said he believed that keeping elements of storylines under wraps was an essential element in drama. "Stories depend on shocking people," he said. "Stories are the moments that you didn't see coming, that are what live in you and burn in you forever. "If you are denied those, it's vandalism." The current series of Doctor Who continues on BBC One on Saturday.